Playwright Richard Ploetz and director, Andreas Robertz discussing the play. Frank has a good life: a wife and son whom he adores, a successful career as an investment banker, a penthouse on Riverside Drive. He also enjoys a secret life, enabled by the internet. He is successfully managing his two lives when he responds to an investigative reporter’s ad thus beginning his third life. However the walls between his separate lives grow increasingly thin, threatening to bring all the players face to face. 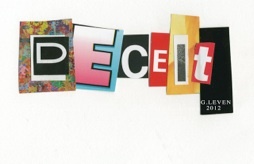 DECEIT is a dark and fiercely provocative comedy that will make you rethink the nature of your own existence. Frank, an investment banker, loving husband, doting father, with a reckless secret. Helen, Frank’s wife, editor of a cutting-edge life-style magazine. Tommy, Frank and Helen’s son, a sensitive eight-year old.